Music Monday..The Christmas Music is Starting to Come! Being the eager beaver that I am for Christmas music, I got Travis Cottrell's Ring the Bells and Casting Crowns Peace on Earth last week. I've mostly listened to Ring the Bells and it's fantastic. It is truly beautiful with gorgeous arrangements, Travis's beautiful voice, and a great selection of songs. Many thanks to Boomama for making me aware this CD was coming back in the summer when she pointed us to a free download of "O Holy Night" Stand-out tracks are: "Hark! The Herald Angels Sing", "O Come, O Come Emmanuel" "O Holy Night" and "Jesus Saves." Definitely worth picking this one up, as I believe it's the sort of Christmas CD to be savored and cherished in the years to come. Olive Snook sings Christmas songs! Yay! This will undoubtedly be fantastic. 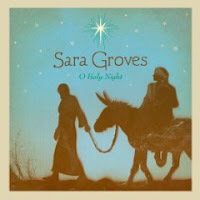 I love Sara Groves! I'm sure this will be great, too. I love Casting Crowns! So even though I'm not a huge fan of Christmas music (ducking, don't throw tomatoes :-), I will probably get this CD of theirs as I love their stuff. I'm really looking forward to hearing Sara's album. I've talked to a couple people who've heard it, and they say it is really good. I'm glad you like "O Come, O Come Emmanuel." I spent a lot of time working on that, and hadn't checked to see if it made the final cut for the album. I adore all the covers! I love Sara Groves as well, I'll have to get that one! Twiga--watch out, the tomatoes are coming, jk! Stephen--well done and congrats it's awesome. No! Not yet not yet not yet! We just finished Canadian Thanksgiving, and we're not allowed Christmas ANYTHING until post-Halloween!! I'm with you, Amy! I love Christmas music and start listening early. One of my favorite groups is the Mannheim Steamrollers. 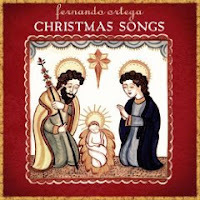 As far as inspirational music, Fernando Ortega is probably my favorite (he led worship at a music conference I attended years ago before he really got popular). I didn't know he had a Christmas album out, so thank you for posting about it. I didn't know Kristin Chenoweth had a Christmas album coming out; that will be fantastic, I'm sure ... her voice is amazing!